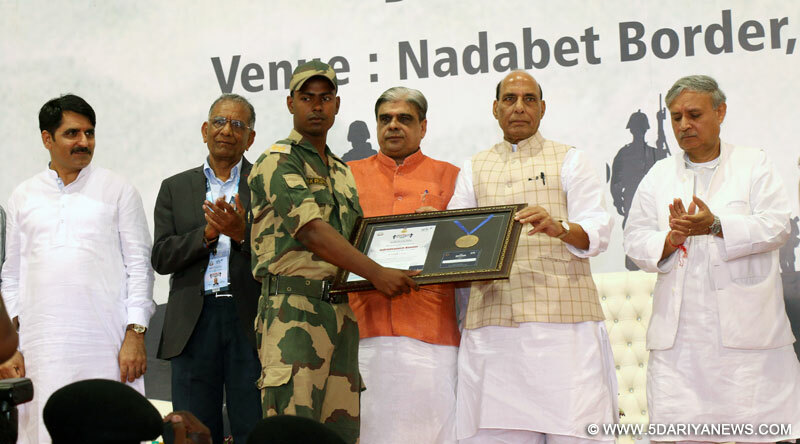 The Union Home Minister, Shri Rajnath Singh presenting the Indradhanush Honour to a Border Security Force personnel, during his visit to the Border Outpost of the Border Security Force (BSF), at Nadabet, in Banaskantha district of Gujarat on June 19, 2016. The Minister of State for Planning (Independent Charge) and Defence, Shri Rao Inderjit Singh and the Minister of State for Home Affairs, Shri Haribhai Parthibhai Chaudhary are also seen. The Union Home Minister Rajnath Singh, Minister of State for Home Affairs Shri Haribhai Parathibhai Chaudhary, Minister of State for Defence Rao Inderjit Singh and Ministers from Government of Gujarat, Shri Rajnibhai Patel and Shri Shankarbhai Chaudhary paid a visit to the Border Outpost of Border Security Force (BSF) at Nadabet in Banaskantha district of Gujarat yesterday. The programme was jointly organized by BSF and SRK Knowledge Foundation. A large number of diamond merchants, local villagers and BSF frontier Jawans attended the programme. Shri Haribhai Parathibhai Chaudhary and Member of Parliament, Shri Mansukhbhai Mandavia were the guiding force behind the programme, being from the diamond business themselves. Union Home Minister motivated the BSF Jawans working tirelessly in the extremely difficult terrains and also appreciated the initiative of diamond merchants, who are known for their benevolence. The programme was meant to enhance interaction of BSF forces with the local community and for welfare of Jawans and their families. SRK Knowledge Foundation, the co-organizer, dedicated Medical equipments like ECG Machine, X-ray Machine, Blood cell counter Machine, 10,000 goggles, R. O. plants at 10 B.O.Ps and 7000 mattresses and an Ambulance van. Cash support was also provided to the families of martyred soldiers. 9 soldiers were also awarded “SRK Indradhanush Award” for their bravery.The programme was attended by Director General, BSF Shri K.K. Sharma, Shri Ajay Tomar, IG, BSF, Chairperson, SRK Knowledge Foundation and diamond merchants from Surat, Mumbai and other places.